Managing Linux with PowerShell DSC – After some hard struggle, we know that success will finally come through. This is what happened when me “A pure windows guy” started testing out DSC for Linux. In this blogpost i would share my experiences on my tests with PowerShell for DSC with Linux so that it can help out folks trying the similar stuff. 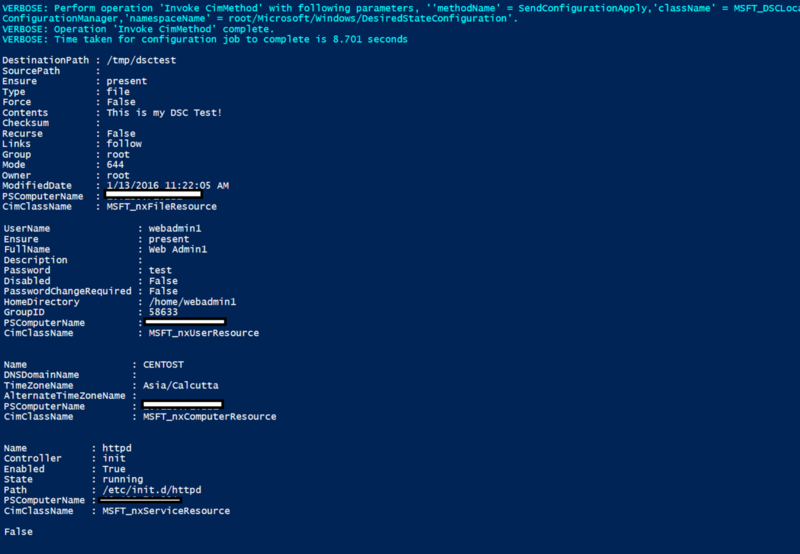 Ok so lets get into what is exactly PSDSC for Linux, its a set of resources provided by Microsoft which allows you to manage your Linux VM’s using PowerShell DSC, the similar way we author DSC configuration we can create configs for managing Linux Infrastructure too. So let me get right into the details. To start with i had a Test VM built with CentOS 6.6 OS as you can see in my vCenter console below. Using a set of OSCustomization specs available i configured an IP, Hostname for this vm at the time i deployed it, and i used as always PowerCLI 🙂 for this deployment too. Next i enabled a ssh session to the vm via Putty and ran the below set of commands to install the necessary packages which consist of perl modules, OMI server and the PSDSC Package. Next we need to start the OMI server using the below set of commands. Here’s a sample view of the commands to install the rpm files. Note :- Rather than doing this manually over the linux putty session, you can save the above set of commands to a configureDSC.sh file and use the Invoke-VMScript cmdlet to call them. The above link would allow you to download an MSI package which when installed would create the necessary folder structures and place the .rpm files and the PSDSC modules. Here’s a view of the folder structure. Also here the view for the modules itself. Once we have all the files , next i used WinSCP to copy over the files to the /temp location of my Linux VM. Once the above steps are completed, i went ahead and installed the modules. using the below set of commands on my linux vm. Note that you need to install all the required nx modules on your server/desktop too. Here’s a view of all nx DSC resources i have on my laptop. Now we are all set, lets build the configuration. Heres the script block which consists of my sample configuration also the DSC Push cmdlet “Start-DSCConfiguration” to push the mof files across my linux VM’s. DSC Configuration to bring a Linux VM to desired state. Once you run the above configuration, you would see the configurations enacted on the Linux VM’s. I hope you enjoyed this blogpost on to manage “Linux DSC PowerShell” and found it useful, and i also hope it helps you out with your PSDSC ramblings.